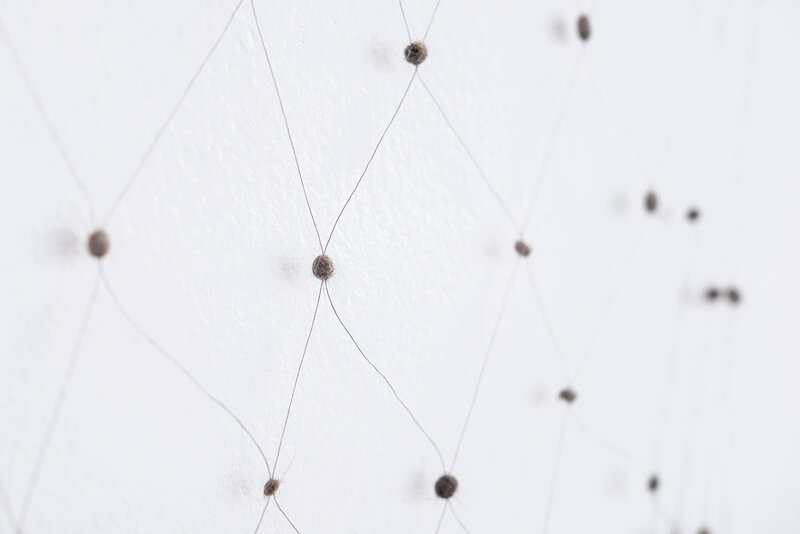 From Lucy with love begins with the logic of wire fencing, in which lengths of wire are twisted around each other to create the required tension, structure and pattern. In this artwork, instead of twisting around itself the grey threads interlock by being sewn through tiny balls of felted cat hair. The hair belonged to the artist's family cat Lucy (1996-2016). After a series of significant life events Lucy became to Gartside a living memory of and point of connection to her happy childhood family life. The work functions as a constellation- in both senses of the word- visually resembling star maps, and metaphorically connecting associated people and memories.